To assist in evaluating whether your site is exceeding the usage limits we will shortly be adding the Maps API to the Google APIs Console. Once available you will be able to track your usage in the APIs Console by providing an APIs Console key when you load the Maps API. If you find that your site does exceed the usage limits each day you can opt to pay for your excess usage by enabling billing on your APIs Console project. We will then start billing excess usage to your credit card when we begin enforcing the usage limits in early 2012. You know what? Good for them. I’d like to think that proving good-looking map tiles with a great API is a good business model. When Google gave away the farm, there was no business model. Everyone just used Google’s tiles and thought nothing of it. The rest of the world who tried to price their tiles so that they could build a business around it were beaten down (Remember something called deCarta?). Now I suspect we’ll see some great creative choices out there that will give users with many options. I think back to this great blog post by Paul Ramsey many years ago. Now there is hope for everyone in this space to succeed because free beer isn’t sustainable. 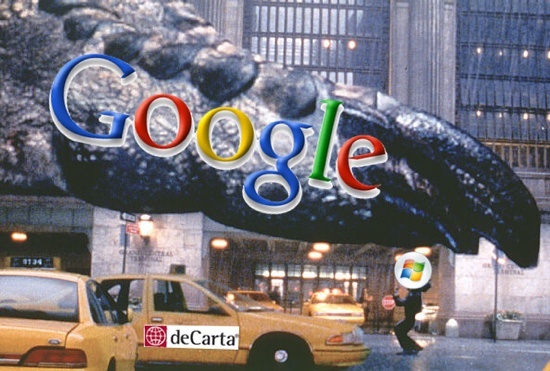 Googlezilla’s foot seems to not be coming down just yet.